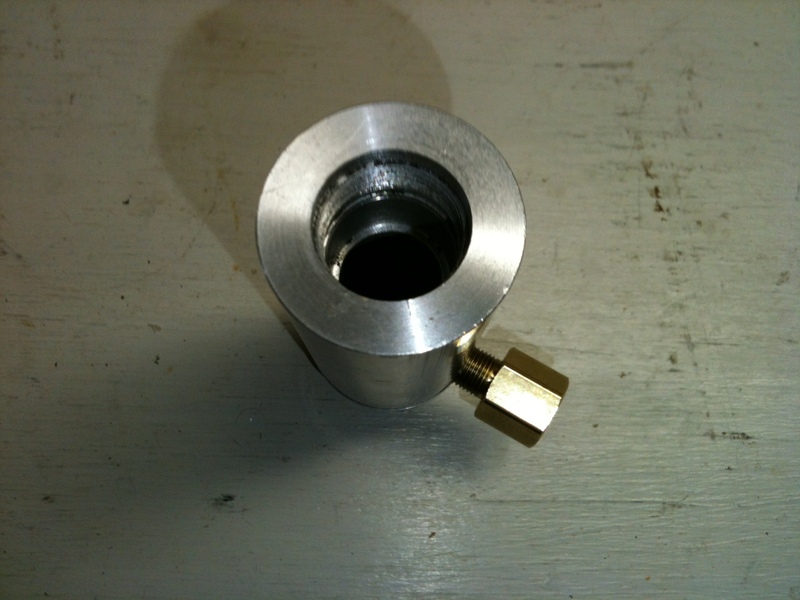 The most recent success in my ongoing RF-45 mill repair project is the fabrication of a new Y-Axis lead nut. 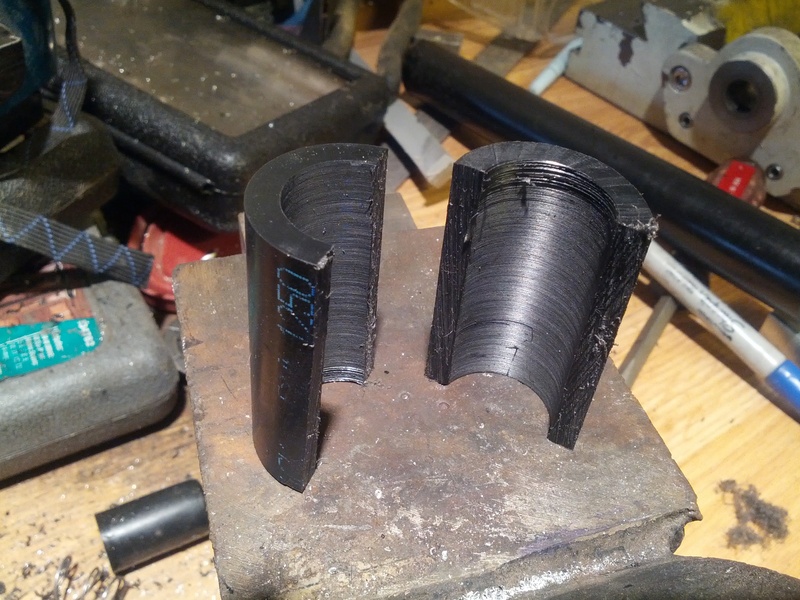 The stock nut was apparently lost somewhere along the way during the attempted CNC conversion that I’m partially reversing, so I had to come up with a replacement. 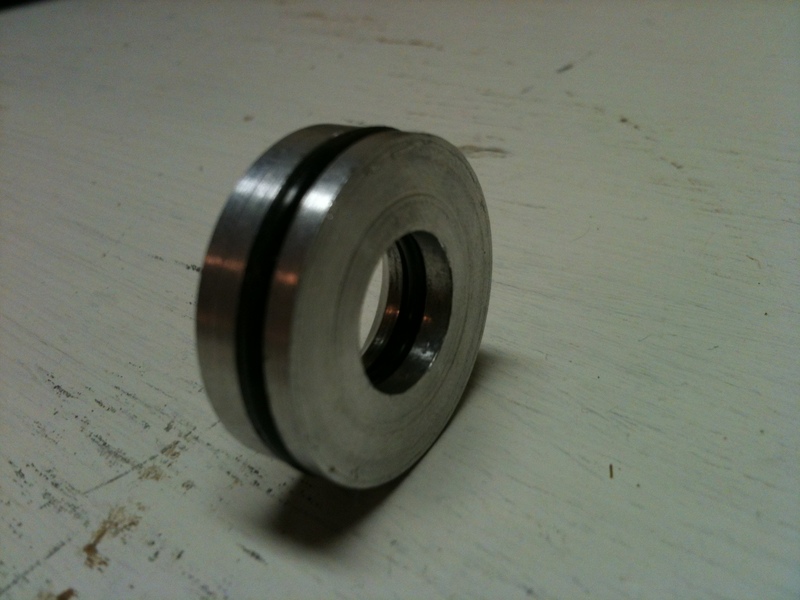 My first thought at replacing the nut was to make a new one out of acetal plastic based on the method described at the Home Shop Machinist Forum. On second thought, I decided it would be much more practical to see if I could find a replacement part online. Like many of the chinese machine tools out there, this mill is one of many clones of an original design. In this case, the Rong-Fu 45 is the original, and my copy was produced by Penn Tools. Unfortunately, I was unable to find replacement parts through them, but Grizzly sells a similar mill along with replacement parts. I dug through the manual to find the part number, contacted Grizzly, and ordered the nut. Easy enough right? Unfortunately, the importer of my mill chose to use 8 TPI leadscrews, while the Grizzly version uses 10 TPI leadscrews, so the nut didn’t work. I returned it to Grizzly, and set off on my original plan of making the nut from scratch. The RF-45 mill I purchased on craigslist a few months ago had some issues… In an attempt to convert the mill to CNC using an extremely oversized ballscrew, a previous owner had milled a pocket out of the bottom of the bed, leaving the material below the bottom of the center T slot uncomfortably thin. With the goal of restoring some of the bed’s original stiffness, I’ve fit a steel plate into the pocket. 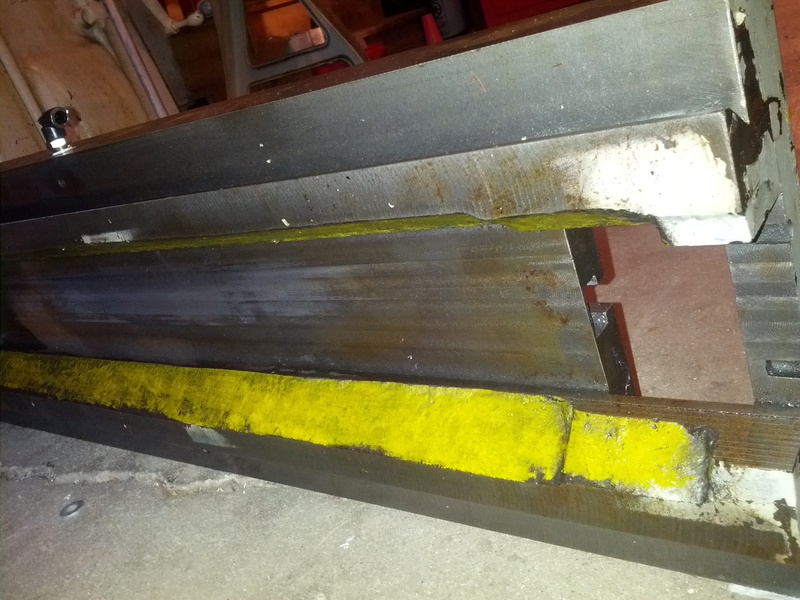 This post documents the process of machining the plate to fit the bed. Following the first day of work, we had nearly completed both the bolt and the charge chamber, and had completed the boltstop. In this session we needed to finish up these parts and create the firing chamber. Brian and I had high hopes going in to this session. He was confident that we would at least fire a shot by the time I had to head home. I was somewhat skeptical! Although we were interrupted by some thermite and Doctor Mario, we were able to achieve this goal. We did the usual shaping and machining to get the firing chamber roughed out and then got on to the fun stuff… threading. Three parts needed threads. The firing chamber and charge chamber had to thread together at the middle of the gun; and we had to thread the inside of the front end of the firing chamber in order to put one of our Spyder barrels into it. 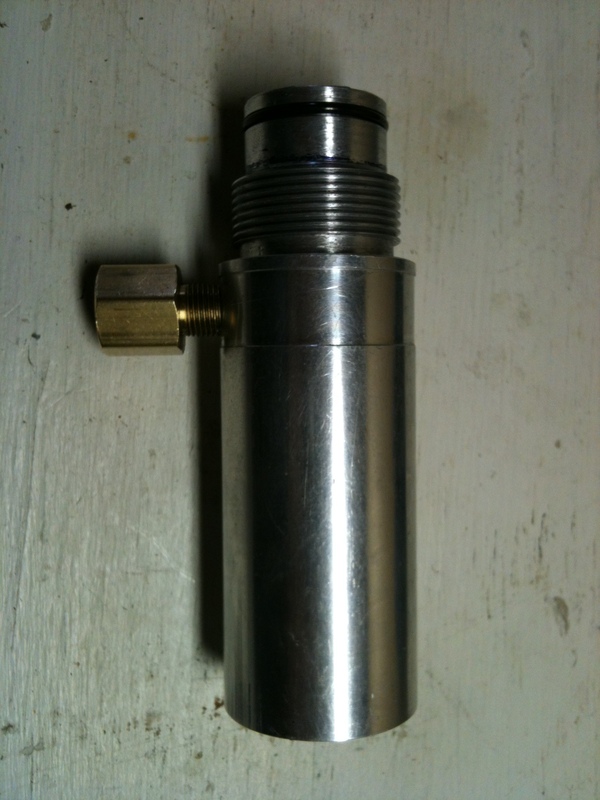 The charge/firing chamber threads would be somewhat simple, as they only have to match each other and require no standardized dimensions. The barrel, on the other hand, has its own thread type that we would have to match. Just to make things more fun, The threads were metric, (M22 x 1.5) and our thread turning gears were standard. Brian worked his magic and got something pretty close to the barrel (7/8 x 16) and we went with it. And I have saved the internal threads from the charge chamber for last to present you with a conversation that took place just moments prior to the cutting of the first internal threads we had done. The embedded video shows our first paintball break on target. The graphic above shows the air system we had set up when we fired the gun. Constant pressure is supplied to the firing pressure input, where the pressurized air waits to be released and force the ball from the gun. The bolt is held back by air pressure from the trigger pressure input. 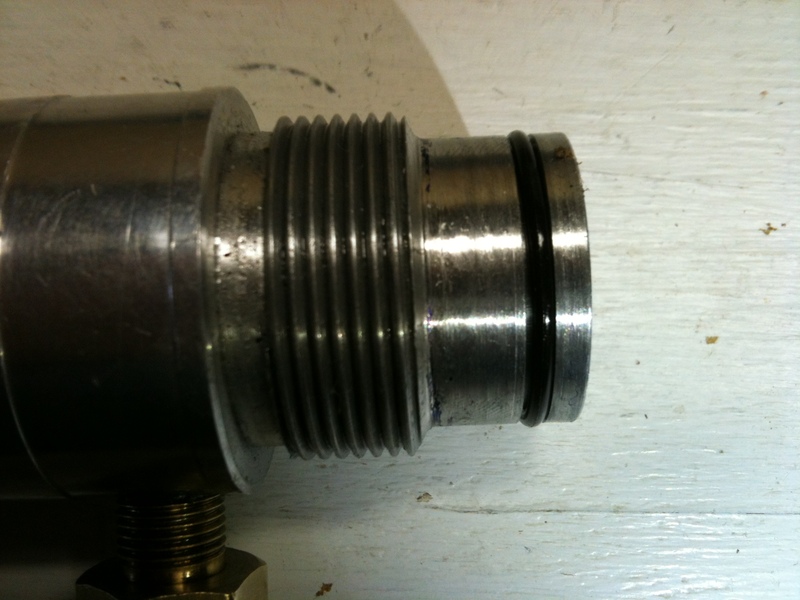 Whenever the air gun valve is open, this pressure is supposed to be keeping the bolt to the rear and keeping the gun from firing. 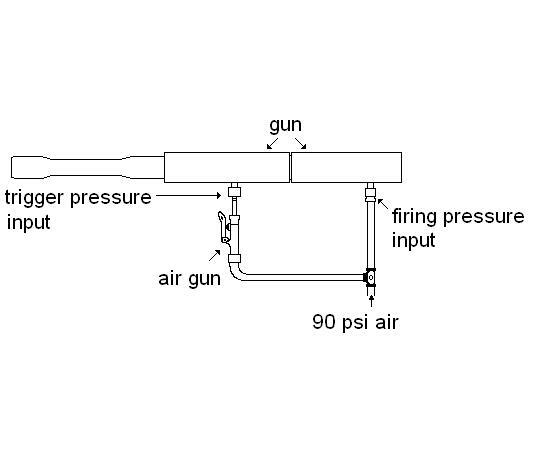 Whenever this pressure is released (the air gun is pulled away from the input) the firing pressure should cause the bolt to move forward and the gun should fire. 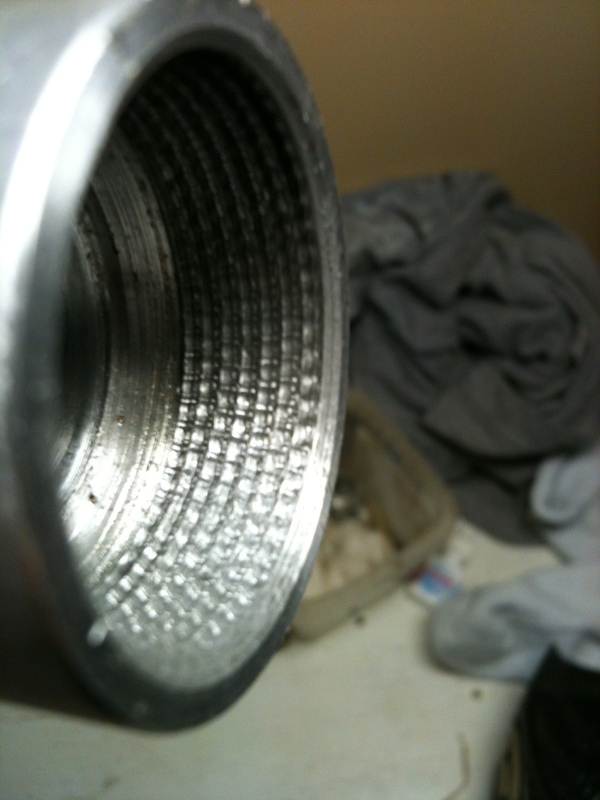 This wasn’t happening for us due to what we speculate to be general surface finish and O-ring fitting issues. With some further work and refinement this should be fixable. We ended up poking the back end of the bolt with random stuff and that provided the motivation required to start the firing cycle. Once Brian had gotten his design work fairly completed, we knew it was time to dive in and start our construction. I got a free weekend and headed up to Brian’s for a long day of trial, and hopefully not too much error! We decided to start work on the smallest and most simple part to sort of “get our gears turning” on the lathe. 😉 This part was the bolt stop, as shown in the picture below and depicted in yellow in the previously posted CAD screenshots. We somehow proceeded to pull it off without a hitch and moved on to some more “interesting” parts.